d. When funds are withdrawn after the first 10 yearly anniversary (exit charge). 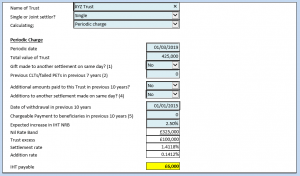 The calculator will taken account payments/addition to additional trusts. Also whether additional funds can be identified within the Trust or if the tax is to be calculated on a ‘just and reasonable’ basis.